Can't bear to live without your vinyl albums, yet can't seem to find the time to fire up the record player these days? 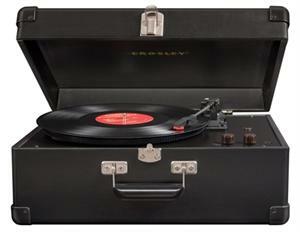 The Crosley Keepsake USB Turntable may be the perfect solution. You can now take your old vinyl and convert them to CD in minutes with just a few simple steps. The Keepsake allows those old albums to be recorded in a digital audio format for high quality sound on a smaller, more modern compact disc. It easily interfaces with the USB port on any computer by utilizing the supplied software suite. However, if you still want to enjoy your albums old style, then Crosley's Keepsake offers a 3-speed turntable for your listening enjoyment. Preserve your entire music collection with the Keepsake.